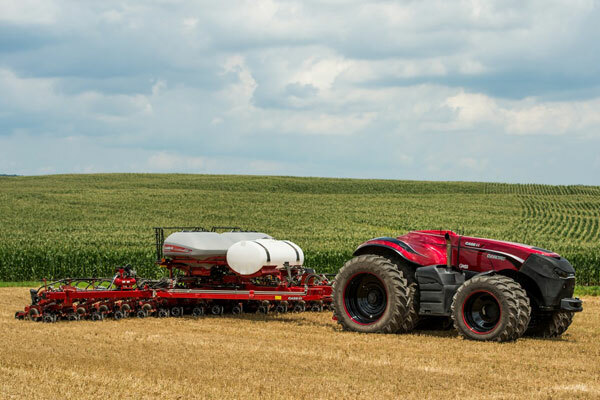 Case IH, a global agricultural brand of CNH Industrial, unveiled the world’s first high horsepower, cabless autonomous concept tractor in 2016, marking a revolutionary step forward in tractor design. The Design Centre used the current Case IH Magnum CVX row crop tractor as the starting point for the brand’s autonomous concept. The concept’s design was focused on both form and function, reimagining the tractor for a future autonomous era by eliminating the traditional operator cab and crafting sleek and dynamic lines. Styling was also used to both enhance functionality and house the required technology, whilst following a coherent design language. The aggressive headlights, sculpted bonnet and distinctive silhouette are complemented by carbon fiber front fenders, two-tone black and red wheel rims and signature LED status running lights. CASE, the global construction equipment brand of CNH Industrial, introduced the all-new G Series wheel loaders in November 2016. Its new standards in operating comfort, interface and safety, make the G Series the most intuitive and easy-to-operate wheel loader that CASE has ever produced. The brand will in fact mark 60 years of wheel loader production in 2018. This particular product series spans seven new models scaled for work ranging from supply yards, building construction and agriculture up to quarries and mass excavation. Every element of the cab of this latest generation range has been designed to provide an automotive feel with industrial performance thanks to its enhanced styling, superior comfort, ergonomy, practical innovation and instinctive technology. The design also ensures best-in-class visibility, with a one-piece windshield that provides an unobstructed panoramic view to the front; multiple rear view convex mirrors, rear view display and slim engine hood offer excellent rear visibility; and the LED work light packages provide great visibility in low-light applications. The Chicago Athenaeum Museum of Architecture and Design and Metropolitan Arts Press Ltd. present the Museum's annual GOOD DESIGN Awards Program for the most innovative and cutting-edge industrial, product, and graphic designs produced around the world.